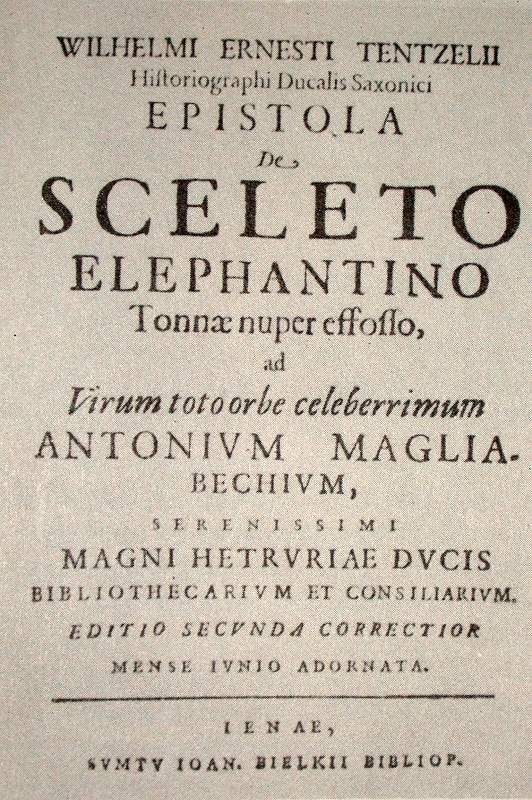 Image: title of the publication by the Collegio Medico. Open: Museum der Natur Gotha: MAY-OCT Tue-Sun 10-17. NOV-APR Tue-Sun 9-16. Fee: Museum der Natur Gotha: Adults 4,-, Reduced 2,-. Group (10+): Adults 3,-, Reduced 1,50. Group (30+): Adults 2,50, Reduced 1,50. Family 9,-. Bibliography: Kahlke, H.-D. (ed.) (1978): Das Pleistozän von Burgtonna in Thüringen. Quartärpaläontologie. 3: 1-399, 137 Abb, 56 Taf., 46 Tab. ; Berlin (Akademie Verlag). Dr. Maul, Lutz Christian (1994): Erster Nachweis von Hystrix in der Pleistozän-Fundstelle Burgtonna (Thüringen, Mitteldeutschland). - Säugetierkd. Inform., 18 (3): 673-682; Jena. Keiler, J.-A. (1995): Libellenlarvenreste (Odonata: Anisoptera) aus dem letztinterglazialen Travertin von Burgtonna / Thüringen. - Beitr. geol. Thür. N. F., 2: 101-106, Jena. 13th century first signs of the quarrying of travertine at Burgtonna. 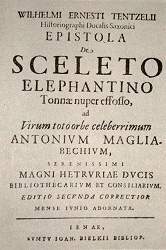 1695 first discoveries of "etliche schreckliche große Beine" (some strange big bones) during quarrying. 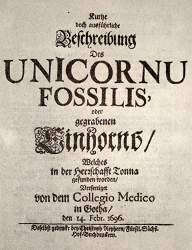 1696 a scientific dispute between Wilhelm Ernst Tenzel and the Collegium medicum in Gotha about fossil Elephant remains in the travertine of Burgtonna is the first evidence of quarternary palaeontological research in Thüringen. 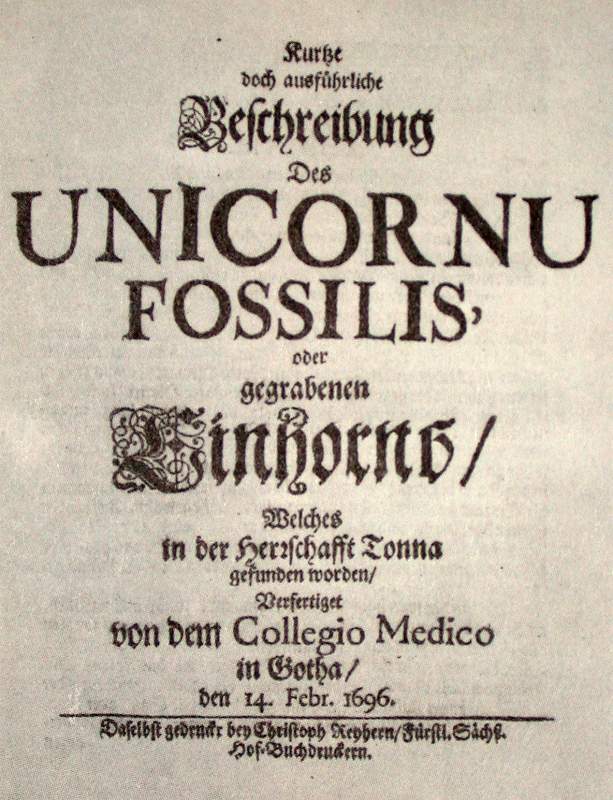 Image: the title of the publication by Wilhelm Ernst Tentzel. The travertine of Burgtonna was formed since the Eem interglazial, more than 70.000 years B.P.. A karst spring formed the travertine, the water of the spring came from the limestone ridge Fahner Höhe. 1695 during quarrying works "etliche schreckliche große Beine" (some strange big bones) were found. The Herzogliche Kammer in Gotha was informed about this. The young duke Friedrich II. came with his cortege to Burgtonna to visit the site. The finders, farmers from Burgtonna, thought this were the bones of a huge animal which was unknown to them. This discovery lead to a vehement dispute between scientists. The Historiograph Wilhelm Ernst Tentzel had the "mad" theory, this could be the remains of an animal which really lived her once. This was really unbelievable to the other scientists, as they could not imagine the necessary climatic changes. The medicus Raab and later the Gelehrte Collegium Medicum had the theory, it was a mineral formation. Wilhelm Ernst Tentzel discerned parts of an elephant skeleton. Andactually the bones were remains of a forest elephant, that lived in Thüringen 100.000 years ago. In 1699, when a second discovery of bones was made nearby, his theory became widely accepted. But the dispute already made Burgtonna world famous. The discoveries were the start of 300 years of palaeontological research and a world famous collection in the Museum der Natur Gotha (Museum of Nature in Gotha). The Museum der Natur Gotha has an exhibition ofobjects from Burgtonna and explains the history of the palaeontological research. It has a huge collection of fossils which is accessible to researchers. Because of the ongoing quarry works in Burgtonna, regular visits and yearly diggings are made to collect new fossils. Search Google for "Travertine of Burgtonna"